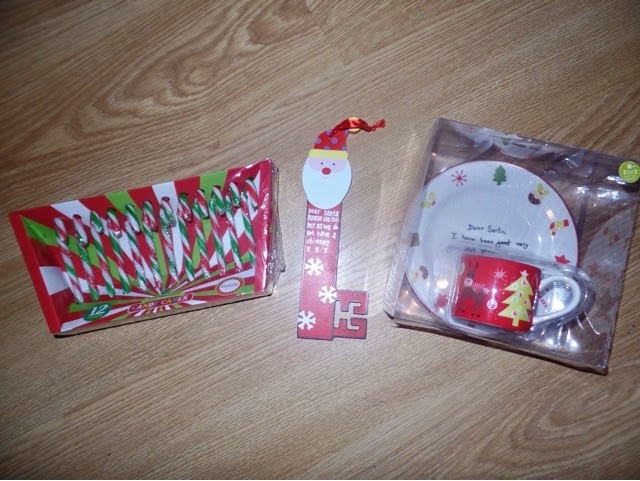 I knew this year that I definitely wanted to do a Christmas Eve box for C after seeing them online last year. As E is only 3 months old, she doesn't need much so if she had her own box it would be pretty empty. 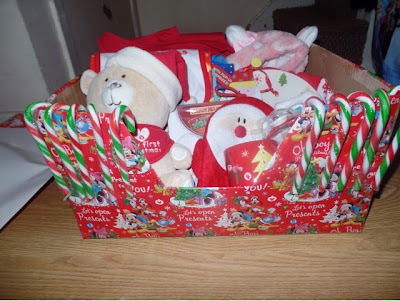 Instead, I decided to do one "family" Christmas Eve box. I think I'll give it to them after we've come home from out post-dinner walk but before bathtime. In The Night Garden onesie for C - I picked this up months ago in BHS for £16. 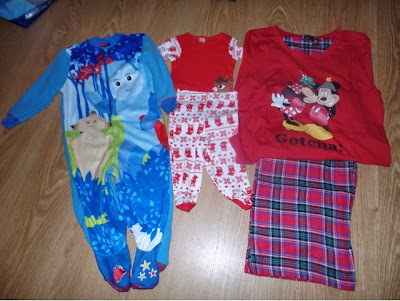 It's a bit more than I'd usually pay for PJs for him but I know his little face will light up. Christmas bodysuit & jeggings for E - I won this in a Facebook competition (it came with the bib that is included in this box too). Mickey & Minnie Christmas pyjamas for myself - Chris's mum actually bought me these so I thought I'd pop them in. 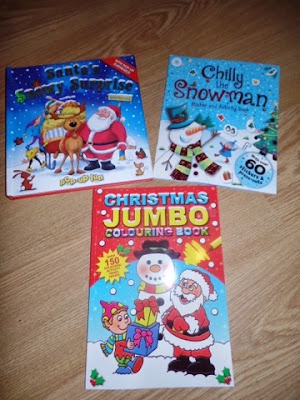 Chilly the Snowman Activity & Sticker Book and Christmas Jumbo Colouring Book - These were £1.99 in The Works. C loves stickers and colouring so they should keep him entertained before bed. My First Christmas teddy - I won this in Tired Mummy of Two's Christmas Tombola and I was so happy as it's perfect for E! 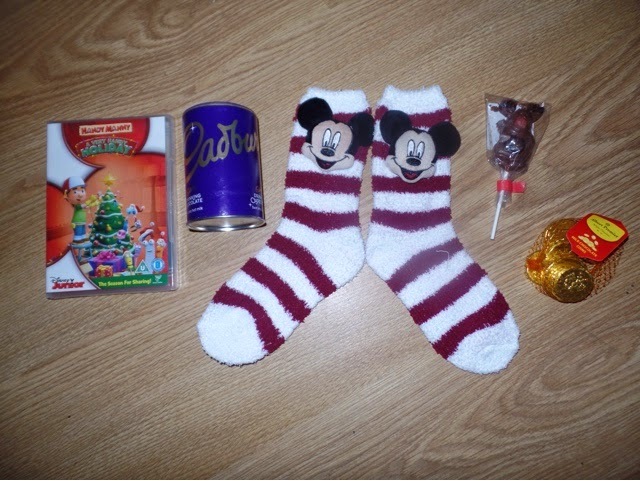 Santa wash mitt - I bought this in Primark for £1.50 just to pad out E's items! 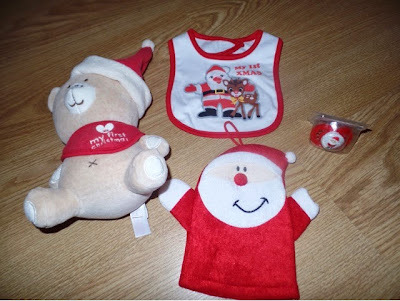 MAM Santa soother - I actually won this last Christmas in MAM's advent competitions! I knew keeping it would come in handy. Handy Manny Christmas DVD - C adores Handy Manny and it's one of the few kids shows that Chris and I can tolerate so we'll all watch this together. Cadbury Hot Chocolate - This will be C's first ever hot chocolate. I hope he likes it! Snuggle socks for myself - Chris's mum got me these in addition to the PJs! Marie (The Aristocats) dressing gown for E - E's first ever dressing gown! 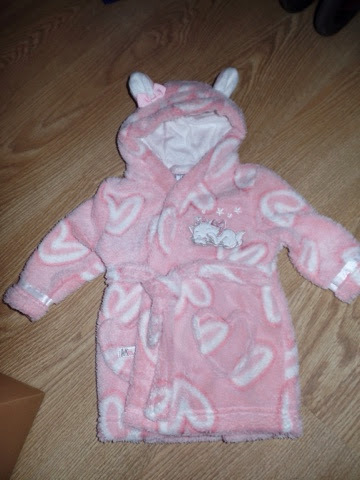 She's going to look adorable! This was only £6 in Matalan. I know I didn't fill it spectacularly but AT 2 years old and 3 months old, I reckonsed that they didn't need very much at all! I hope C will be chuffed with it and get him very excited for Santa coming!